Since the days of conquistador Hernan Cortes, rumours have circulated about a lost city of immense wealth hidden deep in the Honduran interior. Indigenous tribes speak of ancestors who fled there to escape the Spanish invaders, and warn the legendary city is cursed: to enter it is a death sentence. They call it the Lost City of the Monkey God. In 1940, swashbuckling journalist Theodore Morde returned from the rainforest with hundreds of artefacts and an electrifying story of having found the City - but then committed suicide without revealing its location. 'Preston at his best. Entirely non-fiction, this reads every bit as excitingly as any of his fiction accounts. Fast paced, thrilling, insightful, with great descriptions of the excitement and dangers of finding a 'lost' city that had not been visited in 500 years. A great account' Buzzfeed. 'A grippingly told and reassuringly grown-up account of the discovery of an ancient city in Honduras' TLS. 'This gripping book follows every step of the journey ... It's incredible enough that in this day and age there are still unexplored areas of the planet' Geographical Magazine. 'A story that moves from thrilling to sobering, fascinating to downright scary - trademark Preston, in other words, and another winner' Kirkus Reviews. 'Leaves the reader both impressed and over-awed ... An adventure well worth the telling and the 16 pages of colour illustrations add further veracity to the impact' Country Life. 'Deftly balancing swashbuckling action with thoughtful reflections on conservation and the ethics of archaeology' Mail on Sunday, 5 star review. 'Revelatory, chilling, creepy, and alive with deadly snakes and insects bearing incurable disease, it's high adventure at its best and all true' Erik Larson, author of The Devil in the White City. 'Preston, at great risk to his own life, has produced a thrilling and powerful adventure story' David Grann, The Lost City of Z. 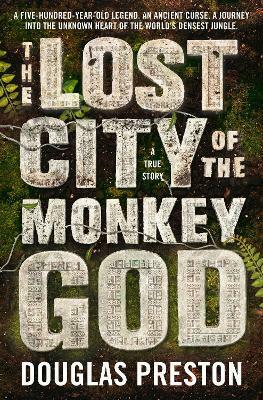 'What reader could resist a new book by Douglas Preston called The Lost City of the Monkey God? Not this reader. Preston's book offers rewards for both the mystery fan and the nonfiction aficionado. The Lost City is addictive-fast-paced and riveting, but it's also important. We mustn't repeat the cataclysmic mistakes of the past. Ironically - as The Lost City illustrates - that's exactly what our short-sighted civilization is doing right now' James Patterson.